What would you do if, while your father was off on vacation, the board of directors of your family’s business (of which you were fourth-generation) voted to give you the boot? That’s right. They kicked you out while Dad was away. Fired you for standing up for the values upon which the business was founded. Silenced, more or less, for speaking out against industry-wide practices that threatened to reduce the quality of your product and mislead consumers. Well, maybe not silenced. Definitely not silenced. But let go. Terminated. Sacked. Canned. What would you do, if you rebounded from that setback by starting your own business, your own winery, and were then told you couldn’t use your own name on the product you created? Long before branding became trendy, before Giant conglomerates (or lone individuals) carefully crafted an identity through a distinct brand that set their products, services, and philosophy apart, and long before the Internet allowed an ordinary person’s actions to “go viral” and catapult him or her (or the entity they represented) into popular favor, Walter Taylor masterfully demonstrated how even small, independent companies in the middle of nowhere could not just survive attempts by industry Giants to stomp them out, but could turn those attempts into the foundation upon which a business could thrive. 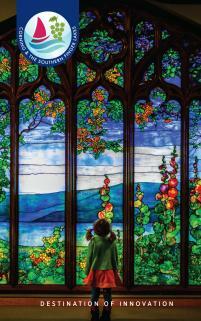 There’s an art to turning sour grapes into one of the largest and most successful wineries in the Finger Lakes. You see, Walter Taylor came to realize that sometimes our biggest obstacles turn into our greatest opportunities. And sometimes the best way to stand up to a Giant is by using its own size against it. Well, that, and by being very, very clever! Born in 1931, Walter S. Taylor was not the sort of person to take the road most traveled. He was intelligent, creative, artistic, witty, passionate, and stubborn, among other things. 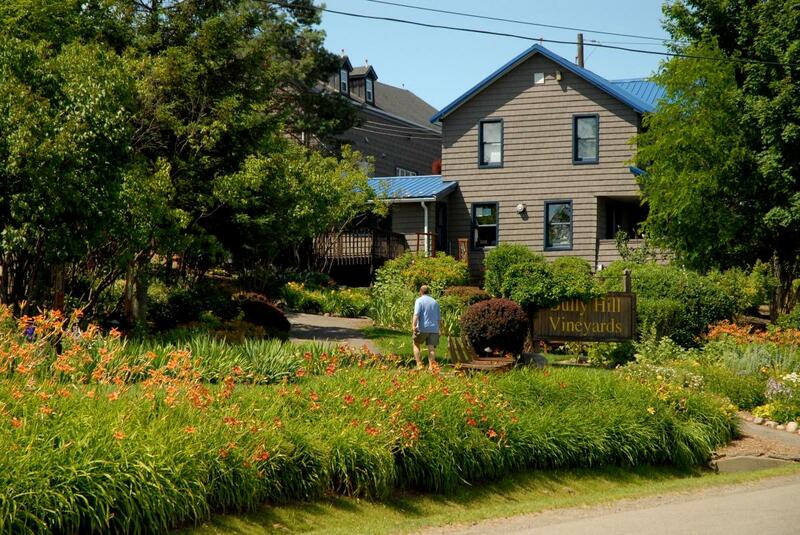 It’s little wonder the winery he would eventually found would become one of the most eclectic in the Finger Lakes. But we get ahead of ourselves. For the story of Bull Hill begins before that, back in 1878 when Walter’s grandfather started the Taylor Wine Company in the small town of Hammondsport, on a steep hill overlooking Keuka Lake. The very same plot of land Bully Hill stands on today. After surviving prohibition, the Taylor Wine Company grew and grew and grew (they became so large they had to build a sprawling complex of building in Pleasant Valley) until they were the largest producer of still wines on the East Coast and the largest producer of Champagne in the entire country. You could say Walter’s interests were diverse. After graduating from Staunton Military Academy in Virginia, he attend Colgate University, University of Miami’s Art School, and the Embry Riddle Aviation School. He graduated from New York State University at Alfred with degrees in Accounting and Animal Husbandry and ended his formal education completing the Harvard University Program for Management Development. Walter found his way to the family business at Taylor Wine Company becoming an Executive Vice President, but he came to realize that controlling the quality of the wine and “preserving the honest family philosophy upon which the winery was founded” was becoming harder and harder, in part due to the winery’s size, but also due to the laws at that time. Walter’s expectations seem quite reasonable. He demanded that New York wines continue to be made with 100% New York grapes, even it was cheaper to bring in grapes from elsewhere. Even if the laws allowed wineries to add up to 25% foreign wine and continue to maintain the New York State appellation. Hard to believe, but that was true. Walter would also not tolerate the watering down of Taylor Wines (literal watering down, that is). Even if the laws at that time allowed for the addition of up to 53% sugar and/or water without any indication of such on the wine labels. Walter publicly spoke out about the misleading practices of several New York Wineries (without naming names). One day, when his father was away on vacation, the winery’s Board of Directors gathered and voted to remove Walter from the business. Walter didn’t sulk. He didn’t complain. He did a most Walter-like thing and seized the opportunity to start his own wine business, returning to the original Taylor land on Bully Hill, which he and his father had bought back some years before with the intention of converting the native grapes over into vineyards of French-American hybrids. Working together, Walter and his father became pioneers for these varieties in New York and the United States. In 1976 Walter released the Walter S. Taylor series of Bully Hill wines, but was later told that he could not use his name on the labels for a Giant—a certain soda manufacturer that shall not be name (but which rhymes with poke, as in you should never poke a Giant)—now owned the name Taylor. What did Walter do? Turned another major obstacle into an opportunity to make a statement and a brilliant marketing strategy establishing, in many ways, the identity for the winery which continues to thrive long after his passing - a winery founded on the motto “wine with laughter.” Yeah, you could say, Walter poked the Giant . . . by outsmarting it. Walter fought the Giant in court, but the Giant won. So Walter got creative. After all, he had cases of wine already bottled and labeled. He could not afford to start over. Inviting friends, workers, and students from a nearby college to a black marker party, they crossed off the Taylor name from each and every bottle. That black bar became a symbol. 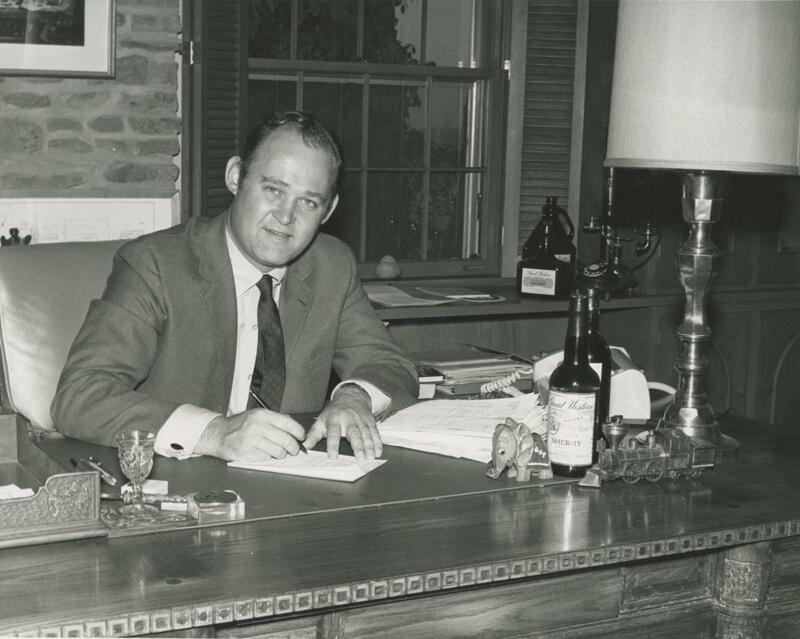 While the name Walter S. Taylor might have been removed from the label, it would never be removed from the essence of the winery, from the essence of the wine. Of course, Walter wasn’t done. As court cases with the Giant continued, Walter was ordered to turn over everything with the name Taylor on it (labels and promotional materials) to the Taylor Wine Company. The judge and the winery, no doubt, expected Walter to quietly hand over these things and be done with it, but they obviously didn’t know Walter Taylor. Did we mention Walter owned a goat? Yep! A goat upon which he painted the name Taylor, then held a parade of sorts through town (which included a number or vehicles, including a manure-spreader which was only apt), gathering supporters along the way and marching the goat all the way to the front doors of the winery his grandfather had started so many years before. Walter handed the goat over, but the Giant refused to take the animal. 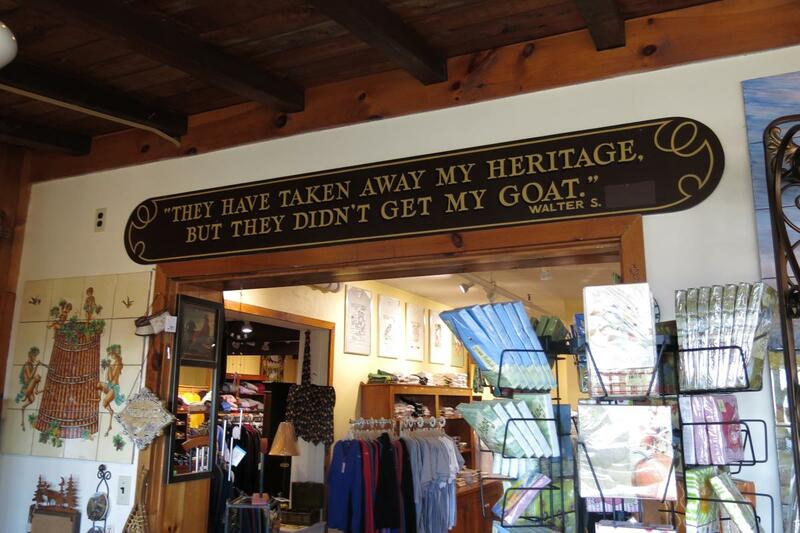 The goat also became a symbol, not just in this instance, but Walter created labels depicting a goat (labels that, to this day, are found on two of the winery’s most popular wines). Interestingly enough, the Taylor Wine Company eventually faded into little more than faint memories and the annals of history. And the Giant, which had purchased the Taylor Wine Company with the intention of building a winery in California and competing on the world stage, found itself in over its head and was finally forced to sell the winery. There are several other fun stories of irreverence and ingenuity related to Walter Taylor and Bully Hill Vineyards, but we suggest you visit the winery to learn about them over a tasting that is sure to have you laughing out loud. While you’re there, explore the Pop Art Gallery and experience some of Walter Taylor’s fascinating visual art (which you will also find on many of the Bully Hill labels). And if you want to learn more about the Finger Lakes Unique history of winemaking in the area, and more of the Taylor story, visit the NYS Wine Museum of Greyton H. Taylor (the first comprehensive wine museum in the country, which Walter founded in 1967 as a memorial to his father) located at Bully Hill Vineyards. There’s no better place for a museum dedicated to the long history of winemaking in the region, as the Taylor family’s own story is inextricably entwined with the narrative about the grape and wine business which has been the lifeblood running through the veins of many small towns throughout the region since the 1800s. With everything from old and obsolete wine equipment, wine casks, cooperage, tools used in the early days of wine making, photographs, glassware, and documentaries, the museum offers a unique glimpse at just how much the industry has changed over the years. 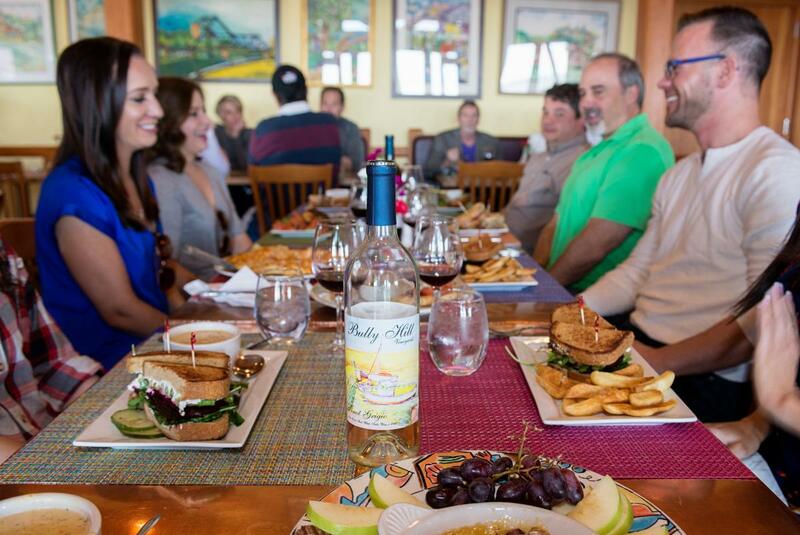 With an exceptional restaurant offering a delicious lunch menu, fun, irreverent tastings daily, two gift shops, and more, Bully Hill has become a destination in and of itself. Bully Hill Vineyards was the first American winery to include this type of warning on their labels. When the labels hit the shelves and the press got wind of what Walter was doing articles started pouring out all over the United States talking about Walter as a pioneer for the alcohol industry.